It is increasingly becoming clear that Nelson Chamisa will face a challenge from veteran politician Douglas Mwonzora in his bid to succeed the late Morgan Tsvangirai as leader of the country’s biggest opposition party, the MDC. Chamisa, who seized control of the party a year ago following the death of Tsvangirai, has seen his stock rise after giving President Emmerson Mnangagwa a good run for his money in the July 31 elections. However, this has not stopped some senior people in the party from plotting to dislodge him at the MDC congress slated for May. One of Chamisa’s three deputies Morgen Komichi (MK) told Standard senior reporter Obey Manayiti (OM) in an interview that those planning to challenge the former student leader are wasting their time. Komichi believes Chamisa’s performance in last year’s elections made him the clear choice to succeed Tsvangirai. Below are excerpts from the interview. OM: What is the state of the party ahead of the May congress? MK: The party is very stable and respective organs of the party are forming up structures, branches, wards and we are now going into the third phase of districts. This weekend we will be forming districts and the congress is taking shape. After that we will go to the provinces and after that people will then campaign in an orderly manner. OM: There are reports of violence and the employment of dirty tricks to win over the structures. What is your reaction to those claims? MK: The national organising committee is in charge of that and they are on top of the situation. Problems will be there but the leadership, which is in charge of the whole operation, is trying to resolve those problems in certain areas where we have challenges. You will expect these small problems where people meet but they are small. Largely the whole process is going on well. OM: How many positions will be contested a the May congress and are vice-presidents going to be hand-picked by the winning presidential candidate? MK: The final decision will be taken by the national council very soon, but the VPs will be contested. All the three positions will be contested. OM: Have you made up your mind on which position you want to contest? MK: I am very much content with where I am. I am going to influence and canvas people to vote me for the VP position. OM: Do you support calls that one of the VPs must be a woman? MK: This is a very good principle but at the end of the day the people have the final say. OM: Do you have a preferred candidate for the president’s position? MK: Yes. 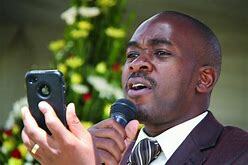 My preferred candidate is Nelson Chamisa. I am happy with his leadership style. He has managed to galvanise people around him and is very popular within the party and outside. He managed to garner more than 2,6 million votes in last year’s elections, which were, however, heavily rigged. With this, what more would you want. In politics you need a leader who people will voluntarily follow to win the elections. The big question is to anyone who wants to lead will he or she be able to win the votes. A person must have a good reason on why he/she wants to contest. They must not be pushed by personal ambitions. A person must be able to lead.What will he bring when they are elected. They must not be selfish. Those who are interested must ask themselves if they are able to produce an outcome that will benefit the people, the party and anything new that will make the party grow. I will advise some of the leaders not to focus on their personal interests but on national interests. OM: So are you advising those leaders not to contest against Chamisa? MK: I will not say they must not, but I will advise them to consider whether it is really necessary. At the end of the day, a person will do as he/she pleases but I don’t see any reason (in contesting Chamisa). OM: Do you think there are any prospects of anyone winning against Chamisa given your position on his track record? MK: The MDC people are going to nominate Nelson Chamisa with ease. He is going to be nominated by all the 10 provinces in the country and our three external ones. No one is going to be nominated except president Chamisa. OM: Why are you so sure about that? MK: You must know the people. I am telling you no one is going to be nominated except Chamisa. OM: There is growing factionalism and internal violence as the congress approaches. Do you think the party has what it takes to emerge stronger from these contestations? MK: Nobody is going to walk away from the party. What is happening now is a situation to deal with competition and under the circumstances there will be high stakes and high pressure. However, I want to assure you that after May 26 there will be harmony and unity in the party because competition is allowed. MDC people know that after the congress they will come together and be one happy family again under one leader. We also encourage unity, reconciliation and we will also go for integration so that we don’t lose on the objectives of the congress. The congress is there to reconstruct the party, rebuild the party and discuss issues that will enhance the capabilities and capacity of the party. We are going to be dealing with institutional reforms, organisational reforms so that we manage to put the party on a new level. We want to modernise the party hence we are urging the members not to focus more on positions but propositions of liberating the people. OM: Do you believe there are leaders within the party that are being sponsored by Zanu PF at this congress as has been alleged? MK: I might not know them by name but I am quite sure that Zanu PF is doing that because one of the key tasks for Zanu PF is to divide our party at congress. Do you know that Zanu PF puts aside a budget to make sure that they divide the MDC and if you look at the previous splits in the party you will realise that Zanu PF was involved. They try to cause confusion and with the poverty currently prevailing in the country, the people are easily tempted. Zanu PF is assisted by state agents and their role is to cause divisions and confusion within our party but we have been so strong that we managed to survive for almost 20 years. Other small parties like the Zimbabwe Unity Movement (ZUM) were crushed by state agents and definitely there is that attempt to do that now but they will not succeed. MDC has survived their shenanigans for a long time. OM: Are these reports of Zanu PF interfering in the MDC not causing friction in the party? MK: We just have to remain vigilant. MDC leadership is so far united and they are aware of the shenanigans. I don’t think there will be anyone who will fall into that trap. This is from experience on how the system wants to destroy us, therefore, we will not give them any chance. OM: What is your take on criticism that you are focussing too much internally and forgetting the real struggle? Is the MDC still committed to its founding values? MK: Congress is a constitutional requirement and we cannot run away from the dictates of the constitution. We have to fulfil that requirement because we have to reorganise, seek a new mandate and reinvigorate our party. We need to bring in new ideas and we will actually come stronger from the congress and we will take on the issues that are affecting our country like economy, electoral reforms, legitimacy etc head-on. OM: Are there any prospects that you will join the national dialogue being spearheaded by Mnangagwa? MK: I think as a concept the national dialogue is a good idea, but the question is on how it is structured. The current set up is just like that of Ian Douglas Smith where he was taking the lead, taking on his side people like (Abel) Muzorewa and (Chief) Chirau. He didn’t survive because genuine parties who were fighting for the people, Zanu and Zapu didn’t join as they wanted an arbitrator who would be considered neutral. This is not only about negotiating but the bigger part or the delicate area is the implementation of that agreement. The facilitator should have the leverage to make sure that agreement is followed through. People can dialogue and such but the question is will they be able to stand on top of the mountain and say their agreement will be implemented. Their agreement will have the international stature, whether the agreement will benefit the people of Zimbabwe or it is just a game to fool the world. We need serious dialogue and we need a person who will mediate in an honest manner, which we will all agree on because that person will be impartial. I don’t know why the Zanu PF president is shy to meet the MDC president for a genuine negotiation. He must be brave enough to meet the MDC president and chart the way forward on where the nation must go. OM: On Friday two convenors were appointed and they are the chairpersons of the Gender Commission and that of National Peace and Reconciliation Commission. Does this motivate you to join the dialogue? MK: Let’s see what they are going to bring, let’s see. The principle is very clear.